A quick look at the differences between the appointments your customers book and the ones you add manually. You may hear our Customer Care Team refer to "offline" and "online" appointments, or even see appointments listed as one or the other when you're doing a search. Let's look at the key differences between these two types of appointments and how Genbook handles them. 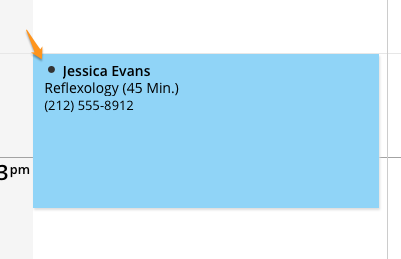 Online appointments are created by clients via your online scheduling page. Clients make these appointments by clicking your Book Now button or scheduling page URL. 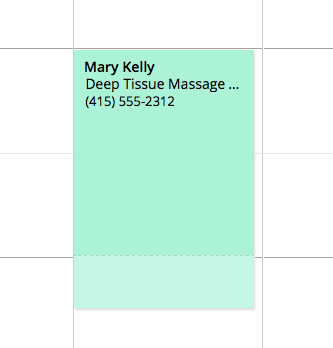 These appointments are denoted by a black dot beside the customer's name, in your Calendar. These also appear in the Inbox, until the end of the day on which they take place (if canceled, they'll appear in red italics). If you and your staff have text message notifications enabled, you will both receive a text when a new online appointment is made. If business-wide email notifications are enabled, an email notification will also be sent for these appointments. Offline appointments are ones you (the business owner/staff member) create manually, directly in your calendar, while logged into Genbook. These appear without a dot beside the customer name, in your Calendar. Offline appointments do NOT appear in the Inbox, and do NOT prompt text message notifications or business-level email notifications. The staff member has "Synchronization via email updates" enabled. The appointment was created by another staff member or account admin (someone logged into the Genbook account using a different email address than that of the staff member in question). Whether an appointment is created Online or Offline will not impact the communications Genbook sends to your clients. Clients are still sent confirmation emails, reminder emails and texts, as well as review requests for offline appointments, just as they are for online ones.